Should we even flag these crimes to any of these Western governments? Well if these western governments and their leaders are not bothered that their own citizens are victims of people demonstrating on behalf of a banned terrorist outfit – we simply say good luck and good riddance. Let these LTTE Diaspora get up to all sorts of mischief and become a nuisance in these foreign climes. Afterall, these very nations that embraced immigrants are now saying adios to multiculturalism. So it is only a matter of time that LTTE Diaspora will become an intolerable nuisance to these western governments. Western governments do not need us to remind them what the LTTE or the LTTE diaspora has been upto over the years. Of course we did cry foul that having banned the LTTE as a terrorist organization it seemed ludicrous to allow its international headquarters to openly function in London while LTTE’s ideological head and his wife openly advocated separatism. But if that is how the West fashions its agenda – so be it. We could never expect miracles from Governments that harbored terrorists and their stooges and chose only to issue sympathy statements for civilian killings by LTTE over 3 decades. From all this it is clear and suffices to conclude that the Diaspora was simply a useful tool to inflict pressures upon the Sri Lankan Government – naturally the Diaspora made the most of the opportunities that came their way. The cries of “discrimination”, “ethnic bias”, “human rights violations” were marketed to perfection both by the LTTE and the Western Governments. For the LTTE, it provided them a cover to hide their brutality and for western nations it was simply a convenient means to advance their own agendas. So while the LTTE were using the Diaspora, the Diaspora were using the Western Governments and Western Governments were using the Diaspora against the Sri Lankan state, it was the citizens of these western nations that were being realistically fooled into accepting a false and hyped up notion of wrongs being done to the Tamil people in Sri Lanka. There are many like Dayan Anthony – recently refused refugee status and turned back to Sri Lanka. His story is that the agent taking money to transport him to the West insisted he play the discrimination card. This is how 1m Tamils have ended up in the West and none too happy to return home and it has nothing whatsoever to do with the Sinhalese. It is the same with the boatpeople. How have they come in possession of such money to be giving to agents who they do not know? Could they be used as ploys to make an international statement? It is not hard to presume that these men, women and children are all low caste and obviously their fate is of no consequence to those that may be sponsoring them to travel on unsafe boats probably not meant to even land at any destination. LTTE has been known for human smuggling and western intelligence have enough dossiers on the LTTE. The Sinhalese have become a convenient scapegoat for people to access foreign shores. This is something minorities are able to misuse with ease. Often the impression that is given overseas by the Diaspora is that Tamils asked to return will be killed. If this argument is true how is it that there are more Tamils living in Colombo amongst the Sinhalese than ever before? How is it that practically all the condominiums built from Wellawatte to Dehiwela numbering well over 250 all belong to Tamils and occupied only by mostly Tamils with owners openly declaring that apartments will not be rented out for Sinhalese! 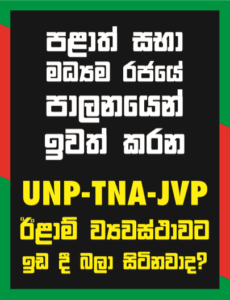 It is impossible for a Sinhalese to play the discrimination ticket on the basis that they are the majority. The only other way is to portray political discrimination, media discrimination etc which have all become key instruments in obtaining passports to foreign shores for some. There are also those that are nothing but anti-Sri Lankan, anti-Sinhalese who are of course lavished with foreign currency and made to continue the campaign to voice such sentiments through organizations that have been set up exclusively for this purpose and staying in Sri Lanka for them is far more lucrative than living overseas where they would neither be creating headlines nor gaining too much limelight! In other words everything is simply a farce. Returning to the question of the LTTE diaspora we do not need to waste time any further in highlighting all the ills that these Diaspora members are upto in foreign shores. Bribing local MPs certainly calls for investigation by these authorities. It is evident that these foreign MPs speak on behalf of terrorist groups, rally alongside Diaspora calling for a separate state, attend terrorist events atop decorated stages where speakers glorify suicide cadres and speaking glowingly about its terrorist leader has nothing liberal or democratic about it and is everything to do with mutual benefits both for Diaspora and these local MPs. It is through these local bodies that most of the Diaspora have come to tap into welfare systems and schemes. Most loans taken are never returned. Using tax payers money hundreds of “LTTE madrasas” have emerged all over Europe where local education authorities have pinpointed that learning imparted is not upto standards and not without query. Hundreds of foreign citizens have become victims of credit card scams all engineered by LTTE diaspora, even several kovils have been subject to investigation for terror financing. It goes without saying that even amongst the diaspora there are differences and divide obviously due to caste and class emerging amongst their own on foreign shores, some of which is being imported back to Sri Lanka. Observe Wellawatte and discover the new face of Tamil males – long hair, at least one earring pierced, driving flashy cars all denoting to mean that they are unlikely to be taking any guns not that any Colombo Tamil did throughout LTTE terror preferring instead to rope in low caste Tamils from the East and the Wanni. If embarrassing Sri Lanka’s head of state is what makes them tick so be it because on an official visit if western Governments compromise the security of a foreign leader its outcome is nothing that should embarrass Sri Lanka but the country hosting Sri Lanka’s head. What Sri Lanka’s missions need to be concerned about is first and foremost to portray the correct picture about why we refuse to accept the argument of discrimination and to showcase the reasons why and to place the fact in order to allow western citizens to derive their own conclusions. With the record that the LTTE diaspora has it does question their right to be pointing fingers at Sri Lanka’s armed forces in the light of none of them sending a cent to uplift the life or livelihood of a single Tamil and how many of them ever raised a voice to insist that LTTE do not turn Tamil children into killers by kidnapping them. There is enough evidence available with the UN to showcase how children were very much part of LTTE’s killing machine. It is not difficult for anyone to accept how the North and East have changed since the elimination of the LTTE. None of these LTTE diaspora will ever understand how it feels for their own people to feel free and neither do they like to accept that the Tamil people in the North and East are grateful and happy that the armed forces are amongst them to protect them now that they have come to realize that the army is not their enemy. The LTTE Diaspora and the TNA have a very dismal record in terms of helping Tamil people – for most part they are no action – talk only or rather action confined to demonstrations and placards disturbing foreign citizens! There are millions of Chinese diaspora all over the world, similarly there are thousands of other diaspora carrying on with their lives – so what exactly is wrong with these LTTE diaspora. From what emerges there are enough differences amongst their own with different forums trying to become THE LEADER of the Tamil people. Some of these power struggles are nothing we should worry over and simply watch the curtain raiser and watch the theatrics unfold – it would be nothing short of how the LTTE eliminated all other Tamil militant parties to become self-appointed as Tamil liberators. Domiciled overseas any mischief LTTE Diaspora get upto has NOW nothing to do with Sri Lanka – Let these foreign governments handle their new found headache. Let us simply get on with putting Sri Lanka in order.